Why did no one notice the boy was missing? Greene: How could a boy live and die, his cries unheard, with no one aware of it? (CNN) -- Why did no one miss him? Why didn't anyone seem to even notice he wasn't around? "Pretty disturbing, isn't it?" asked Rob Arnold, deputy commander of the Lake County, Indiana, sheriff's department. "I think everyone is scrambling to try to find that out." He was 13 years old -- was no one aware, over the course of two years, that he seemed to have simply vanished? "There was no open assessment" of the boy's home under way at the time of his death, said Ann Houseworth of the Indiana Department of Child Services. She said this meant that caseworkers were not looking into the child's situation during the immediate period leading up to his death. Asked whether caseworkers had ever been called to the home earlier, she said that confidentiality provisions in Indiana state law prohibited her from releasing that information. Until the boy's body was found, did anyone in law enforcement have any idea there was a child they should be looking for? "We don't comment on pending cases," said the person answering the phone last week in the office of Lake County prosecuting attorney Bernard Carter. There is, indeed, a pending case: murder. The victim was Christian Choate. Charged earlier this month with his killing are his father, Riley Lowell Choate, 39, and his stepmother, Kimberly Leona Kubina, 45. Christian is believed to have been dead for two years before anyone in authority was made aware that he had disappeared. And although the prosecutor's office does not comment on pending cases, the seven-page affidavit it filed in conjunction with the murder charges speaks distinctly, with cold fury. Born in 1995, he lived with his mother until, in 2005, the father received custody of both Christian and an older sister. They moved in with Riley Choate and Kimberly Kubina on a residential block in Merrillville, Indiana. Several other children lived in the house. Christian was said to be in good health when he arrived, although, according to what family members told investigators, he said he missed his mother and wanted to live with her. The boy began to be punished almost immediately, and was regularly locked in a room in the basement. But when the family moved to a mobile home in a different part of Lake County things got markedly worse. Christian was made to live inside a used metal dog cage. He allegedly was repeatedly struck and kicked by both his father and stepmother. When Christian tried to escape from the dog cage, his father reportedly secured it with seven locks. The keys were kept near the father's computer, where he was said to enjoy playing video games about racing while his son struggled in the cage. 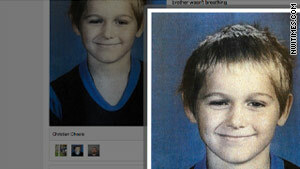 Christian's sister, according to the affidavit, was ordered to take care of the boy. She was instructed to feed him, unlock the cage and take him to the bathroom, force him to do exercises, and physically punish him for failing to follow orders. Police believe that anyone from outside the house who ever asked about Christian was told that he was being home-schooled. Sometimes Christian's hands were chained to the top of the cage; during one such occasion, according to the affidavit, he was crying, so his stepmother, as additional punishment, spray-painted his chained hands black. His health had started to deteriorate, and he had begun to soil himself, so he was kept naked except for a diaper. The only baths he was permitted were with ice-cold water, which made him scream. One punishment was to take him out of the cage and chain him by his hands and feet to an upright bed frame. His feet became numb, and it became difficult for him to stand. Food began to be denied him; when some of the children tried to sneak him food in his cage, according to the affidavit, Kimberly Kubina yelled and told them, "He needs to be locked up. He's a dog." The children were reportedly warned that if they told anyone about Christian, they would receive the same punishment. He learned to try to be quiet during his beatings, because if he cried out they would become even more brutal. In April of 2009, according to the affidavit, after Christian was too ill to eat, his father "punched him with full force several times in the front, side and back of his head before throwing him back in the cage." On the day that month he did not wake up, prosecutors allege, he was wrapped in black plastic garbage bags. His father and stepmother, according to the affidavit, drove to a wooded area, placed a Bible on his chest, covered him with quick-drying cement, and buried him in a shallow grave. That was two years ago. They never reported him missing; their story about him, in case anyone asked, was that he had run away. But not many people asked, because not many people knew he existed. The other children in the home were threatened with severe punishment if they ever said anything. The biological mother? She told investigators she had not been allowed to see Christian or his sister since their father gained custody in 2005. Did she not make any effort to check on their well-being? The answer may emerge at the murder trial. It was the biological mother who, this spring, told police she suspected something bad had happened to Christian. Riley Choate eventually led detectives to the burial place where, on May 4, they found his body, with the Bible on his chest. The coroner's office determined he had died from blunt force trauma, with internal bleeding and a skull fracture. How could a boy live and die, his cries unheard, and have no one be aware of it? How could he be dead for two years and have no one looking for him? "I have a lot of the same questions you do," said Arnold, the deputy commander. "I think the answers will come out at the trial. "But I don't understand it, either. How does a boy just fall off the face of the earth? How can such a thing happen?"